The Republican-adopted plan calls for 2,504 hours of voting spread over six sites the first week, and 22 locations over the second 10 days. 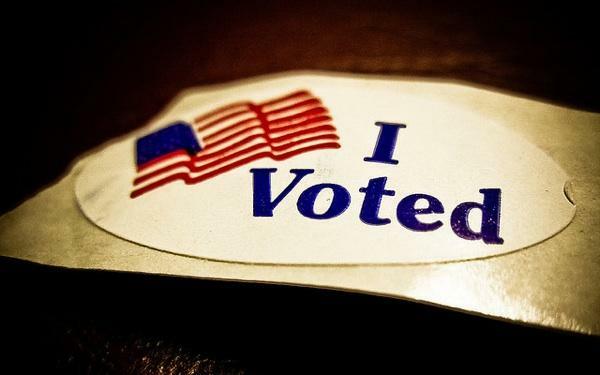 In 2012, the total hours were 2,742 for the in-person, early voting period. The plan now goes to the state board of elections for review and approval. Early voting has become extremely popular. In 2008, 57 percent of the ballots cast that year came before Election Day, while in 2012, 56 percent used in-person early voting. In Mecklenburg County more than 450,000 ballots were cast in 2012, with 55 percent of these ballots cast by in-person early voting. From all ballots, 47 percent came from Democrats, 26 from registered Republicans, 25 percent from unaffiliated voters, and less than one percent from registered Libertarian voters. Each group of registered voter groups had a plurality of ballots cast before Election Day. Among registered Democrats, 63 percent of them cast their ballots early, while 52 percent of registered Republicans and 49 percent of registered unaffiliated voters did so as well. 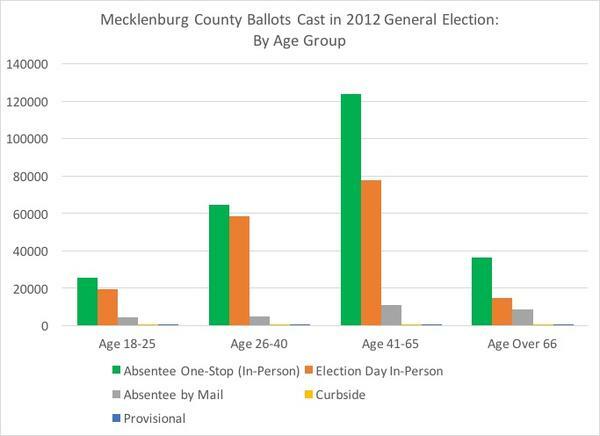 Breaking down the ballots cast by age, Mecklenburg County voters, in four age categories, all cast at least half of the ballots by early in-person voting. While 52 percent of those 18-25 years old used early in-person voting to cast their ballots, it was those voters over the age of 66 that saw the greatest percentage of voters using early in-person voting, with 61 percent casting their ballots before Election Day. Finally, breaking Mecklenburg County's 2012 method of ballots cast down by racial category, one sees an even starker contrast between key groups. 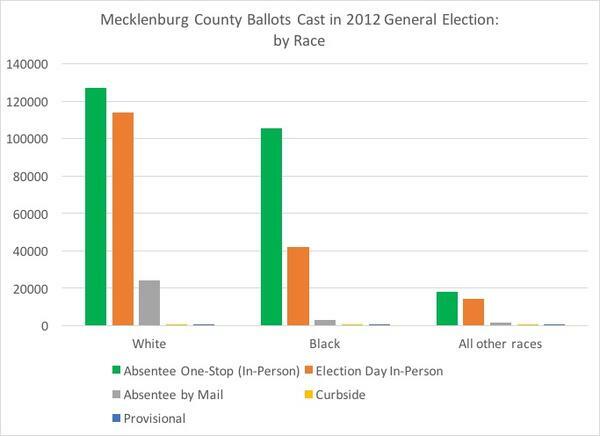 Among white Mecklenburg County voters in 2012, 48 percent used early in-person voting and 48 percent cast them on Election Day. In comparison, 70 percent of black voters cast their ballots before Election Day, with 28 percent casting them on the day. 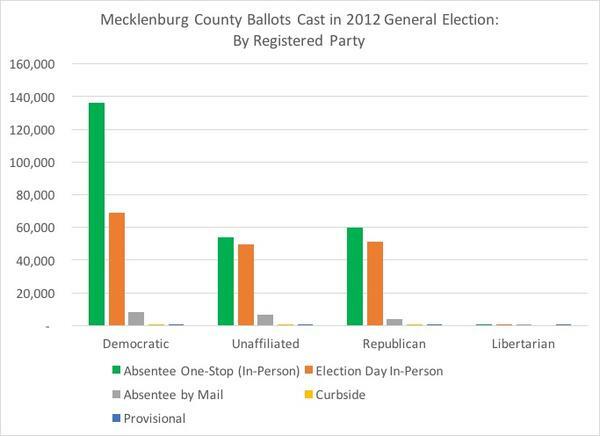 Based on this data, those in Mecklenburg County who used early, in-person absentee voting more than the county average were registered Democrats, old voters, and black voters. Two of those three groups—registered Democrats and black voters (who were 34 percent of the total county votes cast)—are reliably Democratic voters, while older voters (who were 13 percent of the total Mecklenburg votes cast) were 2-1 Republican voters. Since the Mecklenburg County Board of Elections vote wasn’t unanimous, it's up to the state Board of Elections to officially set the early-voting hours. Assuming the state board keeps the early voting hours in place, the 238-hour reduction will likely disproportionately affect different groups of voters. And it looks like it will impact more Democratic voters than Republicans. And perhaps that’s what the majority GOP Mecklenburg County Board of Elections wanted for the state’s second largest county of voters. Copyright 2016 WFAE-FM. To see more, visit WFAE-FM. 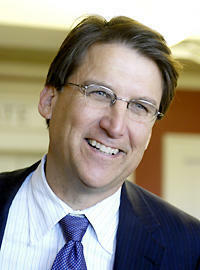 North Carolina Governor Pat McCrory is asking the U.S. Supreme Court to reinstate North Carolina's voting overhaul. He’s requesting an appeals court decision be put on hold through November. The 4th U.S. Circuit Court of Appeals struck down the election changes last month, ruling that GOP lawmakers passed them with discriminatory intent. County boards of election are racing to meet an August 19th deadline to put together new early voting plans. 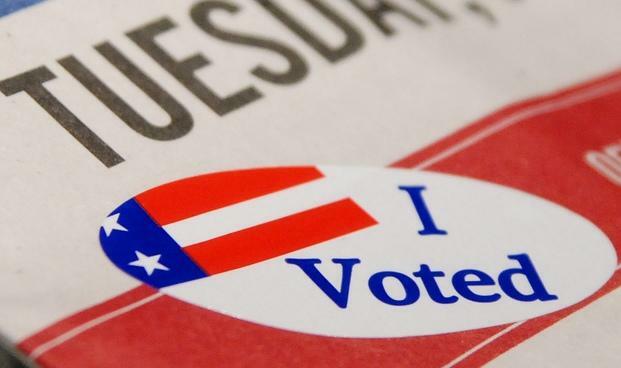 The 10-day early voting schedule adopted earlier this year had to be scrapped when a federal court struck down North Carolina's 2012 voting law last month. North Carolina lawmakers are evaluating their next steps in what's now become a five-year battle over the districts we vote in. Thursday, a federal court struck down the 2011 changes to many state House and Senate districts. WFAE's Michael Tomsic joined Mark Rumsey for analysis of the decision and what comes next. 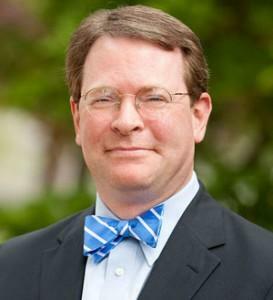 Once again, a federal court has ruled that North Carolina Republican lawmakers unconstitutionally used race in their decision-making.